Relax in our bungalow , surrounded by a 15,000 m² big private park with private beach on the south shore of Lake Wörth. The complex is located right on the lake front to Velden . Luxuriously appointed house ( 140m ² , 45m ² living room, 3 bedrooms) offer an ideal holiday home for 2-6 people. You relax on the beach ( 2 minutes on foot ) with a large lawn , jetty and beach furniture. About a beautiful panoramic promenade can be reached in about 15 minutes the center of Velden . 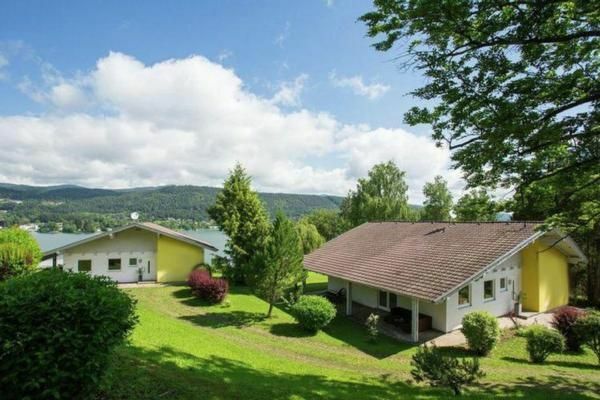 From the house, and from the large covered terrace you have a magnificent view of the large garden , and on the Wörthersee lake and the surrounding mountains . Directly from the house there is excellent hiking and sports facilities such as tennis, horse riding, sailing , surfing, water skiing, cycling etc. There are also several 18 -hole golf courses in scenic area of interest . Our guests receive a discount on green fees at several golf courses. The central location also offers the opportunity to visit the most beautiful areas in Carinthia or take a trip to neighboring Italy or Slovenia. Stroll but during the day through the historic streets of Venice , shop in Udine or taste a glass of wine in Friuli and in the evening you can admire from the terrace of your bungalow in the beautiful sunset or crown the day with an enjoyable visit to one one of the many top restaurants the area. Valuable tips and recommendations, read our house list. As a guest of our Seevilla inexpensively obtained the well-known Kärnten Card , which offers many advantages and benefits. Final cleaning: once per object Costs amounting to 129 EUR (Mandatory). Pet: per object and day Costs amounting to 15 EUR (Mandatory).